Happy Tuesday!! I hope you’re having a great day. Breakfast today was a little more fun than normal thanks to chia seeds! 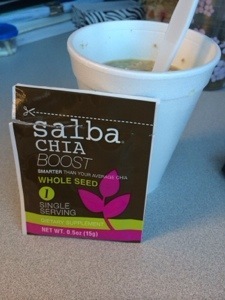 I added this little packet of chia to my morning oatmeal, and it was awesome! 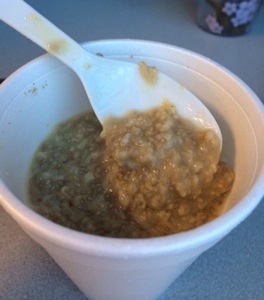 It added a nice flavor and thickened up the oatmeal perfectly. 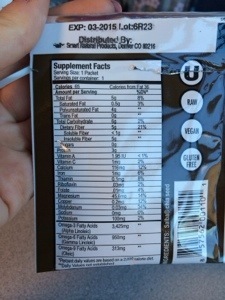 I felt accomplished for the day after reading the nutrition facts on the chia seeds. Those little seeds pack some powerful nutrients! And while we’re on the topic of food, my dinner last night was pretty fab as well. 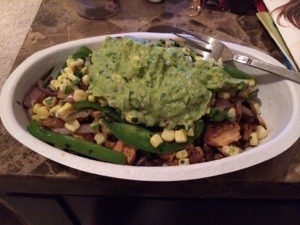 I was near a Chipotle, so I decided I could get a fairly healthy and delicious meal to take home. So I opted for this massive chicken burrito bowl! And it tasted as amazing as it looks. I loaded it with brown rice, black beans, fajita veggies, grilled chicken, corn salsa, and guacamole! It was amazing and I felt like a stuffed piggy by the time I threw in the towel a few bites near the bottom of the bowl. So other than fueling my body with lots of good food and carbs, my only other main anxiety factor is the weather. Why must the weather always be against me?! My first half marathon was run in frigid temps with wind gusts of 40 mph. And now the forecast for Little Rock is around 40 degrees and rainy. Can I not get a race in 50 degree temps with partly cloudy skies? So I’ll be weather watching all week in hopes of the forecast changing to be slightly warmer with no rain. I’m going to be optimistic as long as I can! Send me your positive thoughts as I prepare for my first marathon this weekend. This Type-A girl needs to take a chill pill and know that everything will be ok! What is the worst thing that can happen? If you don’t finish (heck, even if you don’t start!) look at all the wonderful benefits you have had just training for it. Everything will work out the way it is meant to, so don’t worry too much. Do your best and have fun too. Ah, thanks Dede! You are so right. It’s been an awesome experience just preparing for it. Plus I guess there are always more races that I can sign up for in the future!